I am back, gentle reader, and what a journey I have had. I now have a working computer — and boy howdy is it fast compared to the old one. There were a few parts that just aren’t going to work, it appears. XP will not recognize my internal Zip drive, although the bios insists it’s there. It’s very old, however, and may have come to the end of its useful life. Or may have been harmed when the floppy bit the dust. Poor thing. Let us shed a tear. 😥 The floppy drive was fried — quite literally. There’s an amazing amount of smoke that comes pouring out when a floppy drive melts. Note to self: This is not something that should be repeated with any frequency. In fact, never would be good. I pretty much have software back in working order, etc. I managed to recover my mail, so nothing was lost there. Whew. Thank you to all of you who commiserated with me. I was tempted a few times to call Bobby’s hunky techie contact. But then I would have to explain what had happened. I’ve had enough embarrassment over this one, I think. It’s all running again not a moment too soon, because in just a few short hours, I will be heading north for a Floating Knitting Retreat with Cat Bordhi, Lucy Neatby, and other wonderful knitters. Riding around on the ferries through the San Juans and knitting — what’s not to like? I think it’s going to be a blast! I will report back next week. The first picture is what up to now has been called secret project. 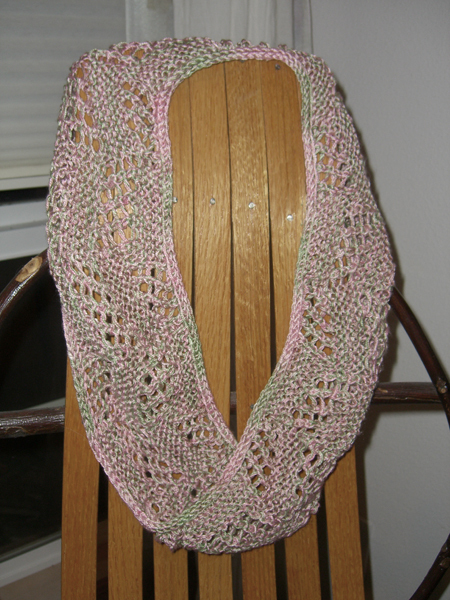 It can now be revealed as a lattice-stitch moebius in Sea Silk. (Note that this one is actually the right size!) This was a birthday present for my friend LT, who likes to wear pink. Although she tells me that she is branching out and trying other colors, so I will have to expand my LT palette. 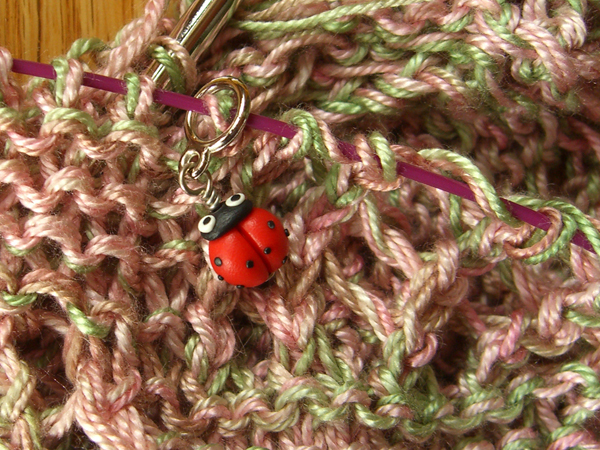 This is a close up showing how the little ladybug stitch marker from J L Yarnworksâ€™ Etsy shop. Isn’t that just the cutest little thing? I had a ton of fun watching it fly around the moebius while I knit, and every time it came to the front, I just had to smile. I have not had much other knitting time. The Coriolis socks progress slowly up the ankles. I like the beads. Next time I’ll show you a pic or two. Yarn: Sea Silk (70% silk, 30% Sea Cell / 100g, 400m per skein) in colorway Rose Garden — Parts of two skeins with a goodly bit left over. Needle: 47″ Knit Picks Options circular, US#6. Not really a lot. I used a lattice-stitch pattern. Cat suggests the I-cord bind-off, which I used.